The dramatic vote in the United States Senate Friday afternoon on whether to even proceed to a final vote on the House-passed continuing budget resolution that includes $5.7 billion of border wall funding placed an intense spotlight on three Democratic senators whose re-election prospects in 2020 are considered uncertain. “The Senate passed a motion to proceed on the House-passed continuing resolution (CR), 48-47, that includes $5.7 billion in border wall funding, which will put the spending bill to a full floor vote soon. Vice President Mike Pence broke the tie on the motion to proceed, which will allow the Senate to vote on the legislation,” as Breitbart News reported. 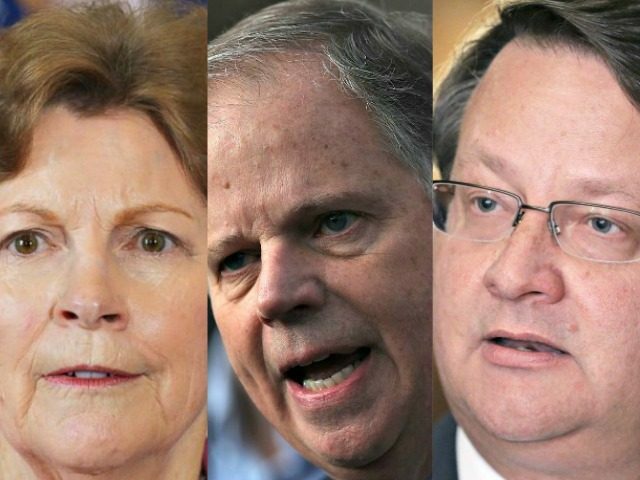 Alabama, New Hampshire, and Michigan offer the best prospects for GOP Senate pickups in the 2020 Senate elections after Republicans picked up a net gain of two Senate seats in the 2018 midterm elections. Senator Doug Jones (D-AL), who won a December 2017 special election in a state President Trump won by 28 points in 2016 under a perfect storm of unusual circumstances that will not be repeated in 2020, was the only Democrat to vote yes on the motion to proceed with the vote on the House-passed continuing budget resolution. The other two Democrat senators who are vulnerable in 2020, Sen. Jean Shaheen (D-NH) and Sen. Gary Peters (D-MI), both voted no. Shaheen has narrowly won two terms in New Hampshire, a state President Trump lost by only five points to Hillary Clinton. Peters is in his first term from Michigan, a state President Trump narrowly won, the first time a Republican presidential candidate has prevailed there since President George H.W. Bush did it in 1988. With a vote on the budget resolution now up for consideration, it remains unclear if the Senate will act. and if it does act, how it will act, prior to the anticipated shutdown of all non-essential government services when the clock hits midnight Friday night, December 21. All three Democrats will now find themselves on the same ballot in 2020 as the president, whose position on that key issue was so popular with voters in 2016, an issue which they are now on the record opposing. Republicans in all three states–who were already chomping at the bit to take on these vulnerable senators–now have explosive campaign material with which to launch withering attacks on two of the incumbents, and before the shutdown drama ends may have material to use against the third, Jones of Alabama. Though Democrats took back the majority in the House of Representatives in the 2018 midterm elections with a net gain of 40 seats, Republicans strengthened their hold on the Senate. The 51 to 49 Republican majority at the end of the 115th Session of Congress when it adjourns later this month will be better by two for the GOP when the 116th Session of Congress convenes on January 3, with 53 Republicans and 47 Democrats, including the two Independents (Sen. Angus King of Maine and Sen. Bernie Sanders of Vermont) who caucus with the Democrats. Though this six seat margin gives Senate Majority Leader Mitch McConnell (R-KY) more breathing room–and lessens the leverage of the two most prominent Republican “moderates,” Sen. Lisa Murkowski (R-AK) and Sen. Susan Collins (R-ME)–Republicans should have picked up an additional two seats in the midterms, which would have given them a 55 to 45 advantage in the Senate. Four Republican flips were offset by two Democrat pickups. In Arizona, the far left Rep. Kyrsten Sinema (D-AZ) narrowly defeated Rep. Martha McSalley (R-AZ), in part because McSally refused to identify with the policies of the Trump agenda. Similarly in Nevada, incumbent Sen. Dean Heller (R-NV), an unreliable Trump vote, was defeated by Rep. Jacky Rosen (D-NV). The Senate map in 2020 is not quite as favorable for the GOP as was the 2018 map, where ten Red State Democrats were up for re-election, but there are several strong possibilities for pickups. Thirty-four Senate seats are up up for re-election in 2020, 21 currently held by Republicans, and 13 currently held by Democrats. Ten–five Democrats (New Mexico, Minnesota, New Hampshire, Virginia, and Michigan) and five Republicans (Arizona, Colorado, Maine, Iowa, and North Carolina)– are in battleground states. Of those, Republican seats in Arizona, where Sen. John Kyle has resigned and Gov. Ducey has appointed 2018 loser McSally to take his place, and Colorado, where first term Sen. Cory Gardner (R-CO) is up for re-election, are at risk, while Democrat seats in Michigan and New Hampshire are at risk. In Tennessee, Sen. Lamar Alexander’s (R-TN) recent announcement will have no impact on the partisan makeup of the Senate when the 117th Session of Congress convenes in January 2021. Former Democrat Gov. Phil Bredesen, the party’s last best hope, was crushed by Rep. Marsha Blackburn (R-TN-07) in the November race to succeed Sen. Bob Corker (R-TN), despite spending more than $7 million of his own money, while receiving the benefit of more than $12 million spent on his behalf by Senate Minority Leader Chuck Schumer’s (D-NY) PAC. The winner of the August 2020 GOP Senate primary and Tennessee will succeed Alexander in the U.S. Senate. If Democrats pick up the two Republican seats at risk, and hold their three seats at risk, Republicans will still maintain a 51 to 49 majority in the U.S. Senate when the 117th Congress convenes in January 2017. In contrast, if Republicans pick up the three Democrat seats at risk, and hold their two seats at risk, Republicans will increase their majority to 56 to 44 when the 117th Congress convenes, closer to the 60 seat cloture proof advantage they would need to push their agenda through uncontested. Friday’s border wall budget vote enhances the chances of Republican challengers of beating two of the three most vulnerable Democrat senators up for re-election in 2020. As events proceed the third, Jones of Alabama, may also find himself in a less advantaged position. Previous Previous post: FBI chief says China tops state-sponsored espionage acts against U.S.